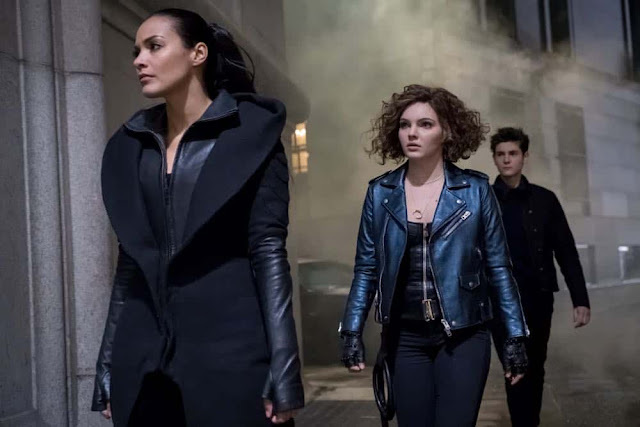 Welcome back to another recap of Gotham, or as I like to call it, serialized episodes of characters making as many terrible decisions as they can in about 45 minutes in the most entertaining way possible. This week's episode, "To Our Deaths and Beyond," is no exception. The episode revolves around two plots: a battle for the powers of the Demon's Head and the Riddler's inward conflict over whether or not to continue working with Lee. The episode opens with Barbara staring at the painting in Ra's vault. Suddenly, she's attacked by masked assassins. She manages to beat a few of them but is ultimately overpowered. One of the assassins then unmasks, revealing herself to be Lelia. Lelia says that Barbara should've seen them coming, as one of the powers of the Demon's Head is to see the past, present, and future (pretty sure that's not an ability Ra's al Ghul had in the comics, but whatever). Barbara asks if they attacked her in an attempt to jump-start the power, and Lelia explains that the powers of the Demon's Head are triggered by intense emotion. Barbara then tells her and the others not to go easy on her next time. Meanwhile, Bruce drives through the streets of Gotham in his new almost-Batmobile with Selina in the passenger seat. She sarcastically asks if it has a covert mode, and Bruce responds by changing the settings to "quiet" with a smirk. Bruce then asks why Tabitha needs to see him and Selina. Selina replies that all she knows is that it's about Barbara and it's important. After parking, they meet Tabitha in the street. She leads them into a dark building. Bruce asks why she wanted him to come, and the room is suddenly lit by torchlight to reveal several male members of the League of Shadows, who grab Bruce. Tabitha explains that Barbara is going to get herself killed unless she gets rid of the mark of the Demon's Head. Selina asks why they need Bruce, and the League members bring him to a coffin, which holds the skeleton of Ra's al Ghul. Bruce begs them not to bring Ra's back and insists that he wanted Bruce to kill him. But the League insists that they need Ra's to live again and cut Bruce's palm with a knife. They spill the blood onto Ra's corpse and begin to chant. As they do, twisted flesh begins to reform on the skeleton. When they're done, a pale, withered hand grasps the edge of the coffin. Bruce insists that they don't know what they've done, and they knock him out to shut him up. Selina says Tabitha should've told her about what they planned to do, since Bruce is her friend. Tabitha reminds her that she and Barbara are Selina's friends too and tells her to pick a side. As they watch, Ra's al Ghul now stands in front of the League, dressed in black with his head covered. Only a skeletal mouth can be seen under his hood. He berates the League for going against his wishes, as he did want to die. One of the League members tells Ra's that Barbara has started a war, but Ra's insists that war is the only way for the League to be reborn and survive. He then kills the man, but another insists that Barbara is selfish and that the League will die if she keeps the powers of the Demon's Head. Tabitha, confused, asks why Ra's didn't get the powers back when he rose from the dead. He explains that Barbara has to give the power to him willingly. When Tabitha states that Barbara will never give it up, Ra's surmises he'll have to kill her to get it. Over at the vault, Barbara sips from a drink. She hears someone coming and turns to see Ra's. She asks what happened, and he replies that it's a long story. He then asks what she's done with his gift. Barbara replies that it's been hard to figure out what to do, since he didn't leave instructions for her or tell all of the League to obey her. He insists that she has to have a plan and asks if she read his histories. Barbara says that she did, but she wants to do her own thing . . . and rule Gotham. She says that the people will worship her like a god. Ra's doesn't like that and tells her to give him the power of Demon's Head back. She says that he promised power, but Ra's said he was mistaken in choosing her. She refuses to believe it and points at the painting. Ra's says the woman in the painting wasn't Barbara; she was just a prostitute that he killed out of pity. Barbara insists that being the Demon's Head is her destiny, but Ra's says that if it were, she would've already unlocked her powers. He mocks her for thinking she's special. He tells her to give him the mark of the Demon's Head, or he'll take it by force. She refuses, and the female members of the League come to back her up. However, they're no match for Ra's. Barbara manages to stop him from killing Lelia, and another female assassin helps Barbara escape onto the street. Ra's follows and kills the assassin, but before he can do the same to Barbara, Bruce pulls up in his car with Selina and Tabitha, who tells Barbara to get in. Once the four of them are back at Wayne Manor, Alfred bandages Bruce's hand, while Tabitha and Barbara argue about whether or not Barbara should've given Ra's the mark of the Demon's Head. Selina tells them both to shut up, and Alfred agrees, saying that they're wasting time. Barbara says they should just kill Ra's; if Bruce did it, how hard can it be? Alfred points out that they had to use the knife to do it and tells Barbara that, after Ra's died, he and Bruce gave the knife to the Nanda Parbat embassy. Tabitha says it's not a problem for them to steal it back, but Bruce insists that he has to be the one to hold the knife. Alfred, naturally, is against that plan, and Barbara is as well. She theorizes that maybe killing Ra's will unlock her powers. Bruce tells her that they can decide who kills Ra's later; first, they need to get the knife. Alfred, as it turns out, has an idea about how to do it without anyone getting hurt. He goes into the embassy with Tabitha and explains that he wants the knife back. The ambassador states that it was never Alfred's to begin with; it belongs to the people of Nanda Parbat. By giving it to the embassy, Bruce was returning a valuable cultural treasure. Alfred says that Bruce merely meant to loan it to the embassy. He tries to bribe the ambassador to give it back, which leads the ambassador to ask if Bruce knows that Alfred came to the embassy. He then tells Alfred to leave and to take his "chippy" with him. Alfred uses this as an excuse to make a scene (a la National Treasure: Book of Secrets). He yells at the ambassador for calling Tabitha a chippy and begins to cough violently. Tabitha says that he might be having a heart attack, and Alfred falls to the ground, "accidentally" knocking over a vase in the process. It sets off an alarm, and the ambassador tells someone to let security know it was a false alarm. While he's preoccupied trying to make sure Alfred is alright, Selina lowers down from the ceiling on a harness, grabs the knife, and goes back up before anyone can see her. Once they regroup with Bruce and Barbara, Barbara insists that she'll be the one to use it and tells Selina to give it to her. Bruce argues that only he can kill Ra's. Selina looks torn, until Barbara pulls a gun out. Selina gives the knife to Barbara, who then shoots out a tire on a nearby car and gets into Bruce's car with Tabitha (you'd better return that Batmobile, missy). They tell Selina to get in, and she does. Once the three of them are back at the Sirens' Club, they're met by the female members of the League. Tabitha asks what the plan is, and Babs replies that it's simple: make her hand glow, summon Ra's, fight him, and stab him with the knife. Selina isn't impressed by that strategy and asks how Barbara expects to beat a zombie that studied martial arts for thousands of years. She says she'd be more reassured if Barbara actually knew how to use the Demon's Head powers and suggests that they call in Bruce for backup (since he was able to kill Ra's before). Barbara points out that Selina took the knife from him, but Selina says she only did that because she thought Barbara had a plan. Tabitha asks if Selina's in or out. "Out," Selina says, "if the plan is suicide by Ra's." Barbara yells at Selina to leave and she does so. Once she's gone, Barbara wonders aloud if Selina's right; if she's just a nightclub owner who can't control the power Ra's gave her. Tabitha encourages her, saying that Barbara has never doubted herself, and now's not the time to start. Barbara, empowered, lights up her hand and waits for Ra's. She explains that she only gave Barbara the knife because she thought that if Barbara could kill Ra's, Bruce wouldn't have to. Bruce says that he would've done what he had to do, but she replies that killing Ra's a second time would turn him into a jerk again (amen to that, sister). Bruce tells her to leave because she picked her side already, but Selina says it's not about sides. It's about stopping Ra's, especially because she doesn't want her friends to get killed. Over at the club, the male members of the League enter and line up to face the female members (plot twist: they're actually about to create the dance-off from Seven Brides for Seven Brothers). The lights then flicker off and on to reveal Ra's. He asks if Barbara has reconsidered. She says that she's done some thinking, especially about what was between the two of them before he died. Barbara says that she'll give Ra's back his power if he admits that they had a connection. He says that she is indeed special and that he's sorry it had to come to this. Barbara agrees, before stabbing him with the knife . . . which does absolutely nothing. Ra's then pushes Barbara through a glass wall. She gets back up and begins to fight. Lelia holds Tabitha back, saying that Barbara has to defeat Ra's on her own. Barbara's hand begins to glow, just as Bruce runs in. He punches Ra's but is immediately restrained by assassins. Lelia reiterates that Barbara must fight alone. Ra's suddenly stabs Barbara in the back. It seems like she's done for, until, suddenly, her hand glows . . . and she's back to seconds earlier (the first sequence was a vision of the future). This time around, Barbara stops Ra's from killing her, but he grabs Tabitha and holds a sword to her throat, threatening to kill her unless Barbara gives him the power. She says she can't give it up, and he slits Barbara's throat. PSYCH! That was another flash of the future. In the present, Ra's tells Barbara to choose, and she agrees to give up the power. They touch hands and the light transfers from her to him. He then bends over, groaning and retching. When he comes back up, his flesh has fully reformed, and he throws back his hood. Bruce tells Ra's to give him the knife so that he can kill him again, but Ra's refuses. "Today is not the day that I die," he says, before snapping the knife with his bare hands. Later that night, Barbara sweeps the floors of the empty club. As Tabitha looks at her sadly, Barbara says it's okay because she knows that Tabitha would do the same for her. The female members of the League suddenly reenter. Lelia says that, Demon's Head or not, Barbara fought for her friends, which makes her worthy. "We follow you," Lelia says. "To our deaths and beyond." Meanwhile, Bruce tells Selina that they can use Barbara's knowledge of the League to find the locations of their safehouses, as Ra's is probably hiding in one. When he says that they'll fix the knife in the meantime, Selina snarks that they can just take it to "the magic knife shop." She tells Bruce that if Ra's wanted him dead, he already would be; the fact that he hasn't killed Bruce means that he likes him. Bruce says it's not about him; it's about the city. Selina tells Bruce that Gotham survived long before Bruce was around. He can take one night off. They almost kiss but are interrupted by a visitor. Ra's al Ghul, the ultimate moment-killer. (And don't give me that "poor timing" B.S., Ra's. You just regained the power to see the future, you knew what you were walking into.) Ra's tells Bruce that he only came to talk to him alone. Selina, however, refuses to leave. Ra's, unfazed, says that she's right; he does like and respect Bruce for who he's become. "You have no idea what I'll become," Bruce warns. Ra's says that he does—or, least, he knows who Bruce could become. Ra's says that he owes Bruce an explanation for why he chose to live. When he took back the power of the Demon's Head, Ra's saw a vision of a cataclysmic event. He calls it a fire that will destroy and purify Gotham. (Uh, your subordinates tried that in season 3, Ra's. Look how that turned out). And Ra's will use the fire to mold Bruce into "a dark knight of Gotham" . . . if it doesn't kill him first. Over at the GCPD, Gordon, Harvey, and Harper discuss a recent string of crimes: five banks robbed in one night. Harvey says that whoever did it is trying to prove a point, and Gordon surmises that if the point is to show how smart the culprit is, the Riddler's probably behind it. He tells Harvey to put a BOLO on the Riddler and also decides to visit Lee to see if she knows anything helpful. Meanwhile, Lee distributes the payoff from the bank heists to the citizens of the Narrows. She tells the Riddler that it went well. He scoffs and says that the people of the Narrows are probably just going to spend the cash on drugs and alcohol, but Lee says they'll also use it to buy food and medicine. She then notices a weird look on his face and asks what's wrong. The Riddler asks, "What am I to you?" She replies that he's a friend and a partner. leading him to sarcastically ask if she's that close to all of her friends. Lee says that she cares about the Riddler and depends on him, but they need to focus on the matter at hand (i.e., the bank heists) before focusing on other things (i.e., their possible relationship). He asks if she's stringing him along, and Lee says that if that's a riddle, he'll want to wait and figure out the answer. She asks if he's ready for the next part of the plan. The Riddler replies that he will be, as soon as he gets a few details straightened out. At that very moment, Penguin barges in with Butch and says that they want in on the bank heists. Lee asks why she should cut them in, and Penguin replies that he and Butch made both her and the Riddler. Without Penguin, the Riddler persona wouldn't have reemerged, and without Butch, Lee wouldn't have had the muscle to take control of the Narrows. Penguin says they need the money from the heist to pay off some of Sofia's capos and says they'll take 50% of the take. Lee, however, refuses. Lee tells Penguin that she doesn't appreciate being bossed around or told who made her. When the Riddler comments, "Well said," and grins at her, Penguin reacts with disgust. He says that he assumed the Riddler was immune to Nygma's affection for Lee, but it must've spread to him as well. Penguin tells Riddler that Lee's using him. Lee tells both him and Butch to leave. Penguin agrees, but not without some parting advice to the Riddler: "Be sure to skim some off the top when she tosses you aside." Later on, Gordon approaches Lee in the Narrows. She notes that he doesn't look like someone who got shot four times, and he replies that his recovery is thanks to her help. Lee replies that she'd been in a good mood after shooting Sofia. Gordon, unsure how to reply to that statement, tells Lee that he's looking for the Riddler, who might be involved in a string of bank heists. She replies that she hasn't seen him in weeks. Gordon pushes, saying that while Lee might feel loyalty to the Riddler, he's still sick. Lee replies that they've all got their flaws, but Gordon says that there are other ways to get rid of her own guilt besides leading the Narrows. She says that she doesn't own the Narrows; only the slumlords do. She adds that he should be trying to protect the poor and the innocent. Gordon then asks about the bank robberies again, this time remarking that none of the guards were killed (which is unusual, as the Riddler has no qualms about murder). He theorizes that Lee's involved and says that whatever's going on, she can talk to him about it. She replies that he doesn't understand what's going on. Elsewhere, the Riddler can't get the Penguin's comments about Lee out of his head. As he sorts through them, he sees a familiar face in the mirror—Ed Nygma. Nygma mocks the Riddler, saying that he's still around. The Riddler insists that Nygma is "too stupid to know when he's lost," but Nygma says he hasn't lost. He points out that the Riddler is acting more like Nygma, particularly around Lee. Nygma says that he's still inside the Riddler, influencing his feelings. He points out that the Riddler has been giving money away to the poor and going along with Lee's plan to support the Narrows. When the Riddler insists that he doesn't care about the people of the Narrows, Nygma replies that that's true . . . because the only person the Riddler cares about is Lee. And if he keeps it up, there'll be no telling where the Riddler begins and where Nygma ends. The Riddler, however, says that he refuses to let that happen. The Riddler then meets with the Penguin and concedes that Penguin was right about Lee trying to use him. He says that he needs Penguin's help to drown out Nygma's influence over his feelings. Penguin agrees to help and asks if he brought a half share of the profit from the heists, but the Riddler explains that it's already been distributed throughout the Narrows. He says that the heists were only part of a much bigger scheme. Penguin remarks that he suspected as much, which was why he and Butch had originally planned to rob the Riddler. Butch asks if the money from the scheme is enough to get him cured, and the Riddler replies that the take is a hundred million per person, as long as they help him deal with Lee. Back at the precinct, Gordon questions a female employee from a bank whose five branches were targets of the robberies. He asks why her banks were hit. The woman replies that she has no idea and asks why Gordon's interrogating her as if she's the criminal. He points out that the bank she works for has been accused of several crimes, including usury. She replies that the bank was cleared of all charges, but he says it's just because they had good lawyers. Harvey, who's been listening, takes Gordon aside into a hallway. He asks what Gordon thinks he's doing, and Gordon replies that the woman is a bigger crook than whoever robbed her. Harvey says that Gordon's only saying that because Lee is probably involved with the robberies. He reminds Gordon that they need to focus on stopping Lee and Nygma before things get worse. Gordon then re-enters the interrogation room and asks the woman which branches of the bank are most vulnerable. She says none of them are, as all of the bank's assets from each branch have been moved to a secure location since the five robberies. Gordon surmises that the Riddler plans to rob that location and asks the woman where it is. Meanwhile, Lee and the Riddler enter the "secure" location and knock out the guards with tranquilizer darts. Lee asks how the Riddler plans to get into the vault, and he replies that they'll have help from some friends. He then asks her a riddle. The answer? "Betrayal," says Penguin, who appears with Butch. The Riddler, Penguin, and Butch get into the vault with the Riddler holding Lee at gunpoint. After filling up the getaway truck, Penguin tells the Riddler that all that's left in the vault is worthless deeds for property in the Narrows. The Riddler then repeats his riddle to Lee . . . before throwing a lighter onto the property deeds and triggering a set of bars that keep Penguin and Butch in the vault. Butch says he'll break out, but the Riddler says that he and Lee will be gone by the time he manages that. He also informs Penguin that, as they've been through thick and thin together, the betrayal isn't personal, but if Penguin comes against Lee, that means he has to deal with the Riddler. As Lee and the Riddler exits, Penguin screams that the Riddler is a fool for trusting her. After they leave the vault, Lee asks why he brought Penguin and Butch only to lock them up. He explains that he needed Butch's strength to open the vault, and also that Penguin had planned to rob them anyway. Lee asks if the Riddler doesn't think she's using him, but he replies that he knows she is. She asks why he betrayed Penguin and asks if she's talking to Nygma. He replies that he's still the Riddler. When she asks how he can be sure, the Riddler replies that he understands her in a way that Nygma never did. He understands that the Tetch virus woke up a dark part of her, and that darkness returned when she shot Sofia. He says Lee loves that darkness, and so does he. That's why he's confident that even though she doesn't love him yet, she will. The moment is interrupted by sirens. Nygma asks how the police could've arrived so fast when he just triggered the alarm. Lee replies that Gordon had his suspicions. Nygma says they need to sneak out the back, but Lee says that she's going to stick around to distract Gordon. She tells the Riddler to take the money to the Narrows. He asks if Lee trusts him, and she replies that she does. She then kisses him and tells him to go. Lee then exits through the front of the building and gives herself up to the police. "You know your rights," is all Gordon says before cuffing her and leading her into the back of a police car. It was pretty satisfying to see Ra's put Barbara in her place. She's been trying to act like a kingpin since season 3, but Ra's sees her for who she is: a petty criminal with an antisocial personality disorder and a need for attention. As for the woman in the portrait, I think Ra's was probably telling the truth about her. (I also considered that he might've had the portrait commissioned after meeting Barbara as a ploy to make her think she was special, but someone with her experience in art would be able to date the work). Do I think Barbara is some sort of reincarnated version prostitute? No. I feel like, at this point, the painting was just a red herring. I do feel like Bruce could've gotten more to do in this episode, but I'm glad he didn't kill Ra's again. Firstly, because Bruce killing anyone is a mistake, and secondly, because I want to see more interactions between Bruce and Ra's (you know, in the three episodes we have left). As for the League mythology, Gotham's seems to be inventing a lot of it as they go along. (The dagger, the blood ritual, the mark of the Demon's Head, the clairvoyance . . . yeah, none of those have been part of the League in other media). I don't feel like it's necessarily a good move to make up this much, but I don't think they've done anything too terrible. Yet. Also, shoutout to Alexander Siddig. The man has only played Ra's for a handful of episodes, but he's wonderful at it. He's powerful, commanding, and unnervingly polite at times. I can't wait to see how Ra's tries to influence Bruce as the season continues. Plot B: I'm glad to see that my suspicions that Lee's using the Riddler aren't incorrect. I'm not sure how I feel about him going with along with it, but I'm interested to see where their partnership goes. Of all the love interests Nygma (or the Riddler) has had, Lee is definitely the most intelligent. She's one of the few people who can match the Riddler for wits (and ruthlessness, at times). Also, I think it's safe to say that even though the Riddler claims to be completely himself at the end of the episode, Nygma's still lurking around. The scheme—to seemingly double-cross Lee, use Penguin and Butch to open the vault, and then double-cross them instead—was obviously the work of the Riddler. But the part of him that defended Lee and decided to continue working with her? That was Nygma, no doubt. The question is, what will Lee do in GCPD custody? Will she try to escape on her own, have the Riddler break her out, or just wait? Will Gordon be able to get through to her at all, or will she refuse to listen to him? I have no idea, honestly. I enjoyed Plot B's exploration of Lee and the Riddler's relationship. It felt a little more grounded than the events of Plot A, which, while exciting, was rather mystical and outlandish. 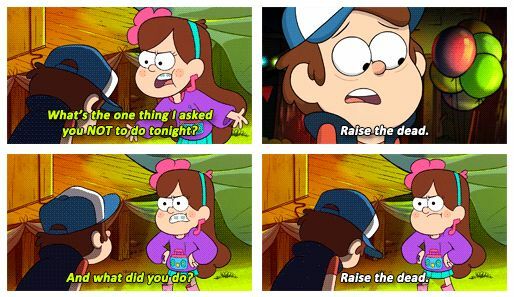 Overall, "To Our Deaths and Beyond" was an alright episode. It's not one I see myself rewatching a lot, but it's not an episode you could skip, as it accomplishes a few important things—like finally bringing back Ra's al Ghul, for one. I do think the episode could've been a little less Barbara-centric, but there are worse characters to focus on. Episode 21, which will air on May 3, is entitled "That Old Corpse." Expect to see a familiar, grinning face when the show returns. For now, feel free to comment below with your thoughts on the episode. Are you glad that Ra's is back? What or who do you think will cause the cataclysm? How do you feel about the Riddler's scheme? Until next time, have a good two weeks. Study for your finals, hang in there, and, most importantly, don't raise the dead.